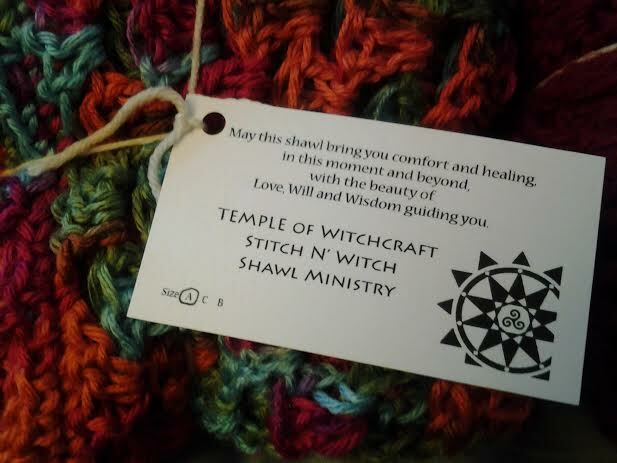 The Temple of Witchcraft’s Shawl Ministry is a prayerful practice and service of weaving the threads of life together with the intention that the recipient be held in comfort, healing, and love. The Shawl Ministry serves in the Social Service aspect of Cancer Ministry as part of the work of care-taking and providing nurturing through serving the greater community. The prayer shawl is a beloved connection to the Great Mother. It is her arms we feel wrapped around us when we are rejoicing or when we are mourning; when we have succeeded, or when our knees have been scraped. The shawl is the symbolic wrapping of the loving Mother’s arms around her children. The blessing of the shawl can be a healing initiation in its own magickal process, opening the way to greater connection within ourselves and our journey. How are the shawls made? 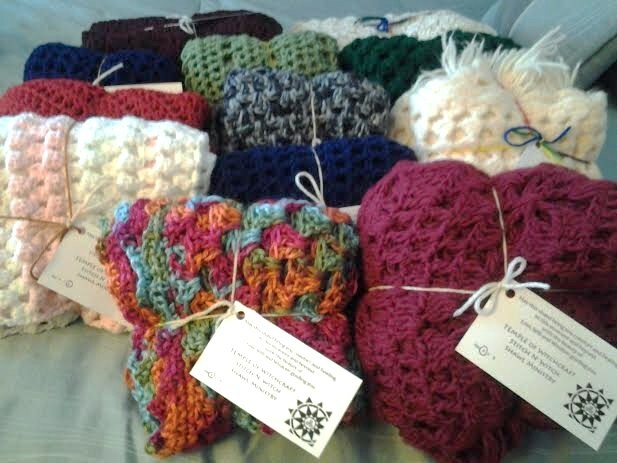 With intention, prayer, and magick, we knit and crochet shawls for those in need. We cleanse and charge (bless and empower) each shawl in ritual for healing to those who will receive the shawls. While these shawls are individually made, they are blessed with the support of the whole of our Temple community. What are the shawls for? The prayer shawls support many aspects of our human journey – shawls can be created for bereavement after a loved one has crossed the veils; the celebration of a baby blessing or a handfasting; healing for illness or disease; rites of passage such as a young girl coming into womanhood, mothering, croning, eldering, initiations, and more. The prayer shawls support life transitions. Do I have to be a member of the Temple to receive a shawl? You do not need to be a Temple member to receive a shawl. We gift shawls to those in need with an open heart and open mind. Prayer shawl requests go on a wait list and are given as they become available. Requests are treated on an individual basis, though Temple members receive priority based on their needs. Can I contribute if I don’t knit or crochet? Absolutely! 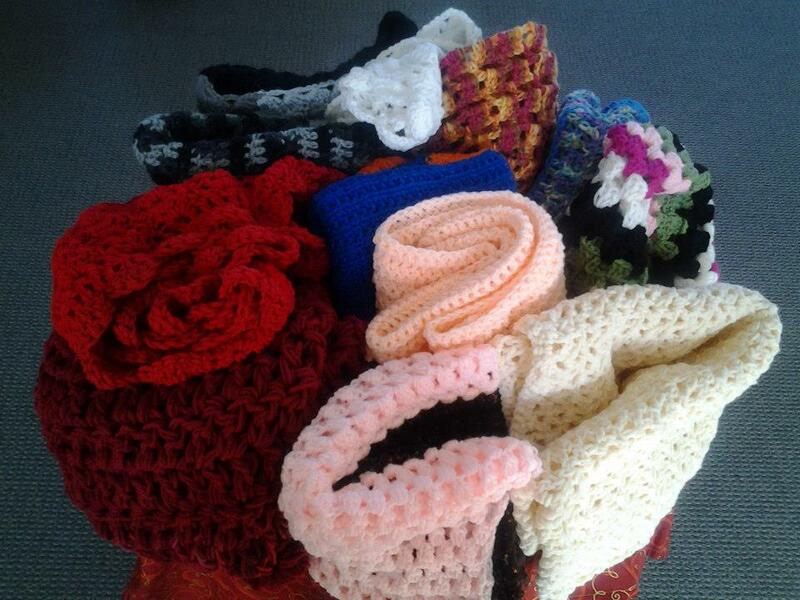 Through the generosity of members near and far, we are able to grow and continue the groundwork for the Shawl Ministry. We accept donations of new yarn (it takes an average of 3-6 skeins of yarn to make one shawl); we also accept monetary donations to cover the cost of mailing via PayPal, just click on the link to contribute in any amount. You can even provide a small recurring monthly donation! Donations are the cornerstone of our work, whether through yarn, monetary, or time, each aspect is honored and greatly appreciated. Can I make shawls and send them to your organization for the Shawl Ministry? Do you have a set pattern I should use? What kind of yarn and color can I make the shawls out of? How can I request or receive a shawl? If you are in need of a shawl or would like a shawl created for someone in need, please fill out the Shawl Ministry request form and someone from the Shawl Ministry will respond to your request as soon as possible.